Hair growth on your face or underarms may make you feel less feminine. Thankfully, the aesthetic professionals at MD Advanced Skincare use laser hair removal to restore your smooth, feminine features — so you can spend less time shaving and more time enjoying your favorite activities. To learn more about laser hair removal, schedule a consultation at the Houston, Texas, location online or over the phone. Women with excessive facial hair have a condition called hirsutism, which is the result of above-average levels of male hormones such as testosterone. Genetic factors also seem to play a role in how much hair grows on different parts of your body. It’s important to work with your primary care provider to manage any underlying health conditions that may be causing facial hair growth. Laser hair removal helps minimize the symptoms, but it doesn’t provide a cure. Hair may still grow after laser hair removal if preexisting health conditions have not been addressed. Laser hair removal is a medical procedure using concentrated laser energy to decrease each hair follicle’s ability to produce hair. The pulsating light beams deactivate the follicle without damaging the surrounding skin. 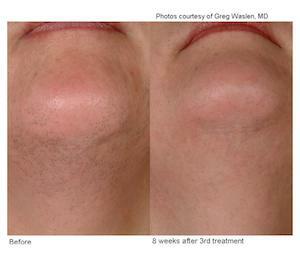 The experts at MD Advanced Skincare use Cutera xeo® to perform laser hair removal treatments. The xeo laser treats a quarter-sized section of skin every second, incorporating surface cooling technology to offset the heat from the lasers. This advanced technology is a fast, comfortable way to stunt hair growth, and it produces permanent results after three to seven treatments. Which areas of the body can laser hair removal treat? Right after treatment, you may experience some discomfort, but ice and special creams minimize those effects. You can expect some shedding as the damaged follicles release individual strands of hair. However, these after-effects shouldn’t prevent you from jumping right back into your routine. After three to seven sessions, you should achieve permanent to semi-permanent results. Some people, particularly those with lighter hair, will need periodic maintenance treatments. Overall, people with dark, coarse hair and light skin achieve the best results from laser hair removal, because the pigment in the hair is what absorbs the laser energy. As laser technology continues to advance, it can handle more cases of unwanted hair. If you’re interested in laser hair removal, set up a consultation with MD Advanced Skincare online or over the phone.